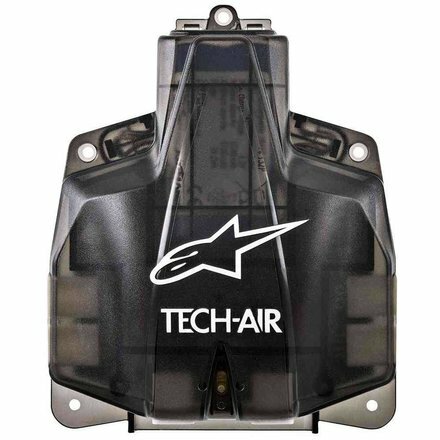 Go for safety, choose Tech Air airbag by Alpinestars. 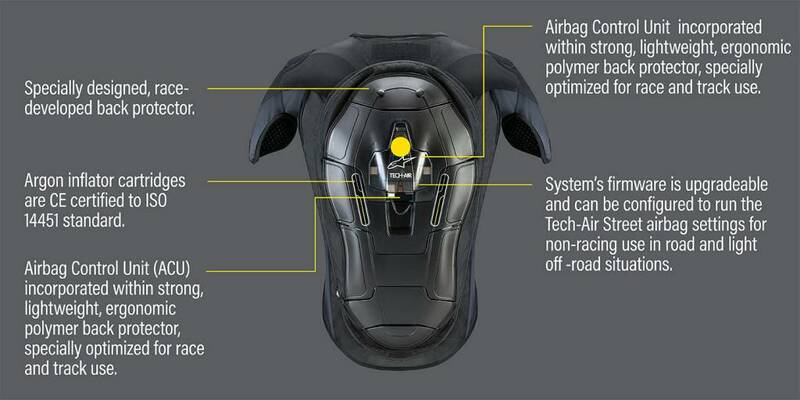 Ergonomically profiled, performance fit airbag vest optimized for use with compatible racing/performance riding airbag leather suit. 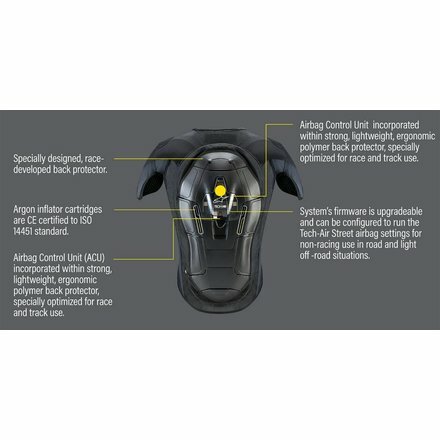 Electronic Airbag Control Unit (ACU) incorporated within strong, lightweight, ergonomic polymer back protector, optimized for race and track use. 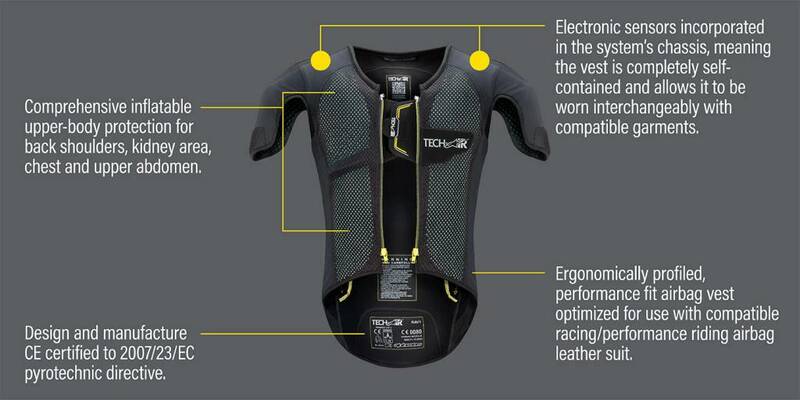 Electronic sensors incorporated in the system’s chassis, mean vest is completely self-contained and allows it to be worn interchangeably with compatible garments. 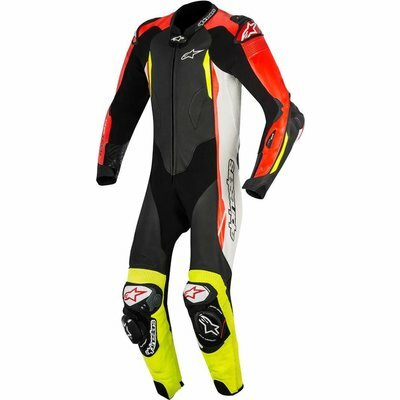 Advanced multi-material main shell incorporates Lycra®, 2D mesh and Cordura. Interior comprises of perforated Lycra, 3D mesh and soft touch edging for high levels of comfort. 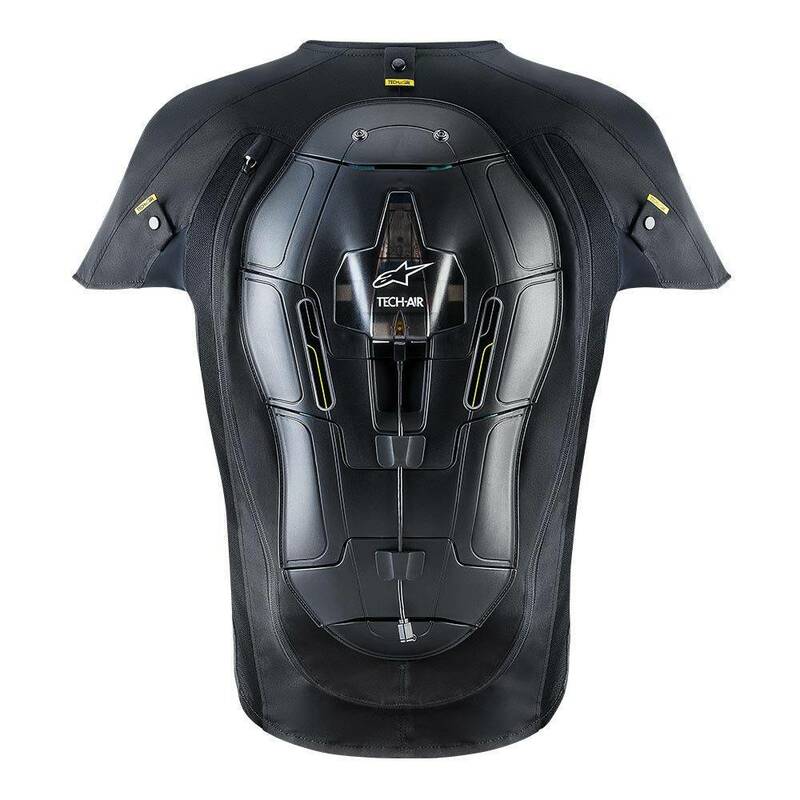 Specially designed, race-developed back protector, offering comprehensive inflatable full upper body protection for back shoulders, kidney area, chest and upper abdomen. 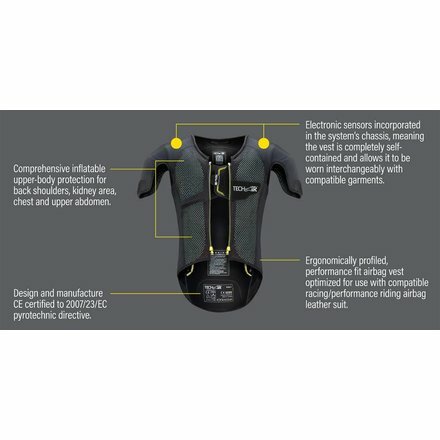 Incorporates removable inner mesh and elastic Velcro® waistband to position airbag system and ensure custom fit and improve adjustability. Deployment system utilizes argon inflator cartridges which are CE certified to ISO 14451 standard. 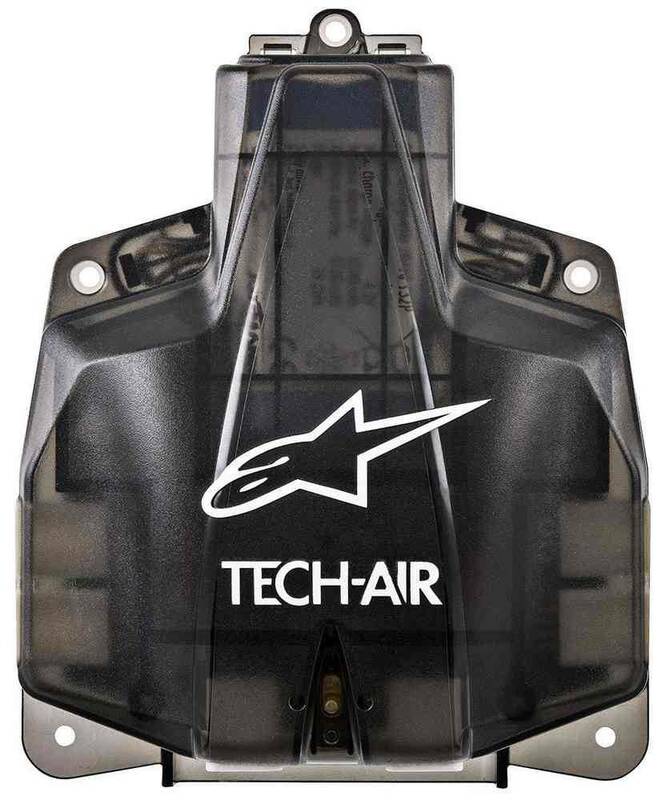 System’s firmware is upgradable and can be configured to run the Tech-Air Street airbag settings for non-racing use in road and off-road situations. ACU is seal-protected within vest to ensure its all-weather performance and the vest and componentry are certified to function in all weather conditions between -10⁰C and +50⁰C. ACU has been homologated to ECE R10 04, which ensures the electromagnetic integrity and stability of the unit. 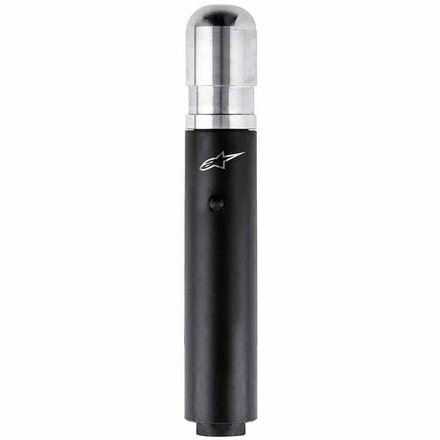 System uses an integrated, certified lithium ion battery, with a battery life of 25 hours and a recharge time of approximately 6 hours. 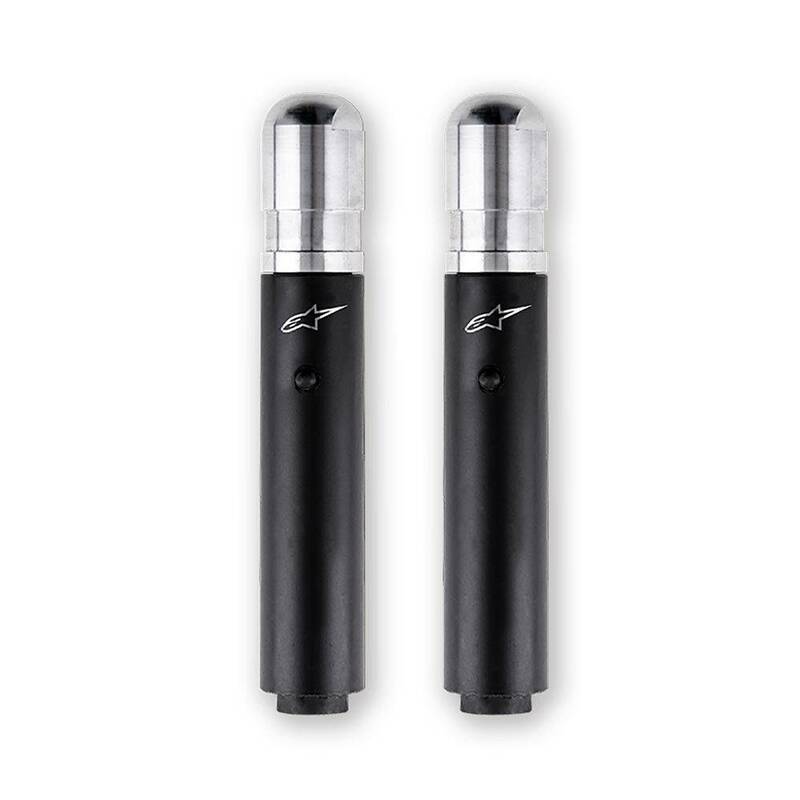 Micro USB charger allows convenient recharging of system, with one hour of charging time giving four hours of riding coverage. 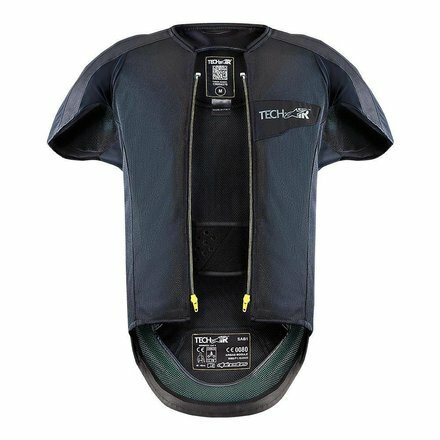 System vest incorporates convenient connection system, allowing system to be connected to race suit quickly and easily for peace-of-mind activation of airbag and LED display. Category II CE Certified to the 686/89/EEC European PPE Directive, using a version of EN1621-4:2013, which guarantees impact protection performance between 45 milliseconds to 5 seconds. Design and manufacture CE certified to the 2007/23/EC pyrotechnic directive.